A delegation of 15 Gush Shalom activists visited today (18.8.04) the families of Palestinian prisoners, who are conducting an open-ended hunger strike. 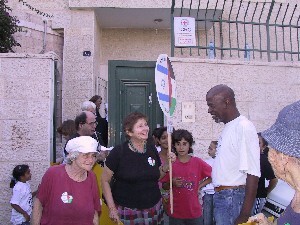 The families are striking at the East Jerusalem Red Cross offices. 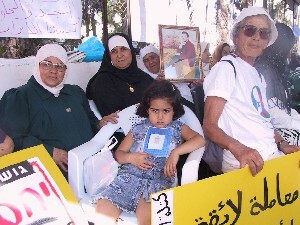 The delegation carried posters in Hebrew, Arabic and English, demanding “Decent Treatment of Prisoners of War”. Delegation members emphasized that, since the Israeli government insists that the present confrontation is a war, they are duty-bound to treat their prisoners as prisoners-or-war, with all the rights safeguarded to P-o-Ws under international conventions. The prisoners’ families received the delegation members warmly, thanking them for encouraging them at their difficult time. They strongly condemned the Minister for Internal Security, Tsahi Hanegby, for saying that he doesn’t give a damn if the prisoners “starve to death”. They expressed their fear for the lives of their beloved ones. Before this visit, the delegation was present at the Supreme Court proceedings concerning the wall in a-Ram. They expressed their deep sorrow after the court cancelled the temporary injunction forbidding the government to start building.